When you receive a phone call, to tell you that a potential suitable deceased donor transplant is available for you, you must make your way to Beaumont Hospital as quickly as possible. Bring a bag with a change of clothes, toothbrush, toiletries, pyjamas, and whatever you may need during your stay. You must not eat or drink from the time you are told to come to Beaumont, as you must be fasting prior to surgery. Please note that when you are called for a transplant there is no guarantee that you are going to receive a kidney. There will be a number of further tests that will need to be done. These tests might show that this particular kidney is not suitable for you. The kidney transplant operation has been perfected over many years. All adult kidney transplants, in Ireland, are performed in Beaumont Hospital and all children’s kidney transplants are performed in the National Children’s Hospital, Temple Street by the Beaumont transplant surgery team. The transplanted kidney is placed in a different location to your existing kidneys. It will be placed in the right or left side of your lower abdomen, just above the hip bone. 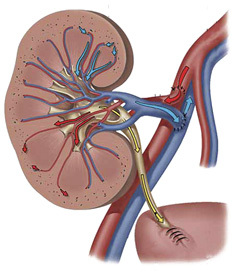 The arteries of the new kidney are connected onto the blood vessels, going to your legs, and the tube from the new kidney is connected to your bladder. The transplant operation takes about 3 to 4 hours. After the operation, you will be taken to the specialist high dependency transplant ward for the first 5 to 7 days. When you wake up after the operation, you will have a number of tubes connected to you. You will have a tube in your bladder called a catheter and a number of drips in your arm or neck, supplying you with fluids. Also you will have oxygen supplied to you by a mask. The day after the operation most people will be out of bed, sitting in a chair, and will be allowed to gradually start eating on day two. The catheter in your bladder will stay in place for up to five days. Sometimes a small plastic tube, called a stent, will be left near your bladder for 3-4 weeks. This will be removed through the bladder at a later date as a small procedure conducted as a day case. This involves a small camera being inserted via the urethra into the bladder. If you have been on dialysis for a long time, the bladder will be small which means you will probably have to urinate very often. This will improve with time. You length of stay in the hospital will depend on your health and how quickly your new kidney begins to work. Most patients spend between 7 and 14 days in hospital, after the transplant. It is not unusual for your kidney not to work straight away, and you might need dialysis after your transplant. This does not mean the newly donated kidney is not going to work. It may take 2 or 3 weeks to work fully. Your doctors will monitor many factors relating to your new kidney. In particular, they will measure your creatinine level and drug (immunosupression) levels each day. The lower your creatinine level, the better your new kidney is working. If your creatinine does not come down as low as your doctors would like, they might recommend a kidney biopsy. A kidney biopsy is a procedure where the doctor puts a needle into the kidney to take out a small piece of tissue to examine exactly what is going on in the kidney. In particular your doctor wants to know if there is rejection developing in the kidney. An ultrasound machine is used to locate the kidney and the skin in the area is numbed with a local anaesthetic. 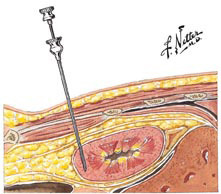 A small needle is inserted through the skin, into the kidney. After a kidney biopsy, you will be admitted to hospital overnight, as it is necessary to monitor you for potential complications. The risks associated with performing a kidney biopsy are small. The main risk, is bleeding after the biopsy. The risk of bleeding, such that you would need a blood transfusion, is about 1 in 100 and it is about 1 in 700 that it would bleed badly enough to require surgery. If you develop some rejection, you will be prescribed a high dose of steroids for between 3 and 5 days. This almost always reverses the rejection. Occasionally, patients develop a severe rejection that requires a treatment called ATG. It is also possible to develop a form of rejection called humoral rejection that requires a special treatment called Plasmapheresis. It is quite normal to feel emotional after a transplant. Feelings can range from elation to tearfulness, from joy to sadness. People can feel vulnerable emotionally and even overwhelmed. These feelings usually settle down quickly. Counselling will be available. If you are being treated for depression, prior to your transplant, it is advisable to continue taking your anti-depressant medication. Your doctor will advise you about this.